Partick Thistle remain the only side not to take any league points from Rangers this season after Saturday’s 2-0 defeat at Ibrox. And in truth they rarely looked like breaking their duck as their eight-game unbeaten Premiership run came to an end. After an opening half-hour which was lacklustre to say the least Rangers gradually began to threaten and Jon Toral had a netbound strike booted clear by Mustapha Dumbuya. Only a fine stop by Cerny kept out a powerful Danny Wilson header, but the Thistle keeper had no chance when the home side made the breakthrough after 39 minutes. James Tavernier whipped in a terrific ball from the right for Kenny Miller to send a header thudding off the turf and back across Cerny into the corner of the net. Thistle’s only real opening came when Ryan Edwards got into the Rangers box after a Barrie McKay blunder but the angle was too tight to squeeze a shot past Wes Foderingham. Rangers doubled their advantage nine minutes after the break, Toral steering the ball home after being superbly set up by Emerson Hyndman. 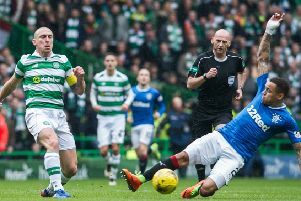 Cerny had to produce two fine diving saves low to his left to keep out shots from Martyn Waghorn and Miller before blocking an Andy Halliday strike and acrobatically tipping over an admittedly offisde Joe Garner’s rebound effort.